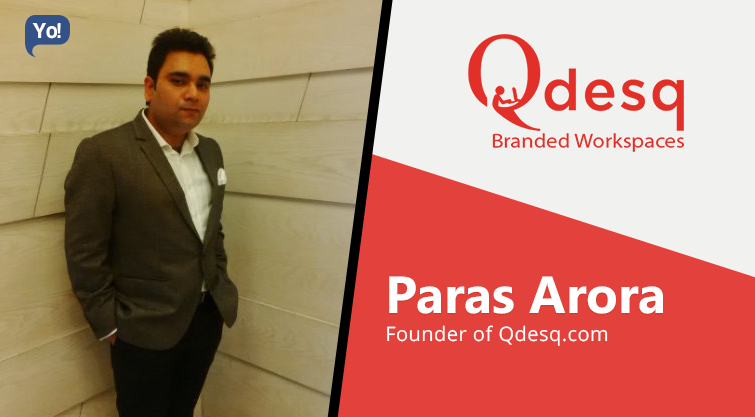 Paras is a dynamic professional with immense knowledge of retail and his territory of work. He has an expertise in business development, Strategy and negotiations. After completing his post-graduation diploma in international business, he completed his masters in retail strategy. He started his career as an associate director at Colliers International. Soon he climbed the ladder of success driven by his ingenuity and excellence. He came into limelight with his latest stint as a founder of Qdesq. It is a ready to move in office brand that creates delightful office occupancy experience by bringing in standardization in pricing, features and amenities. Property owners can monetize there unused/vacant office space by listing them at Qdesq. I have worked as a real estate and asset management professional for more than 14 years and one thing that I noticed while working in the industry was that the requirements of new age workforce is very different from traditional workforce. They demand for flexibility but do not want to compromise on location or facilities. Idea clicked when I discussed this with my co-founder Lavesh Bhandari on how there can be a platform with which we can get serviced and managed office at prime locations but nearby to our home. This is when his tech expertise came into play, and he suggested these problems can be easily solved with the use of technology. We then started working on Qdesq where corporates and property owners can signup and list their unused office space which can then be taken by SMEs and startups to work from serviced offices to avoid distraction at home offices and of crowded cafes. The initial challenge was to get venue – space providers on board. Since the concept of Qdesq is unique and life changing. It has now gone viral, all the venues in last 3 months have come organically without much business development and education to space providers. Qdesq has two offerings broadly: QOffices and QCafes. We have meeting rooms, private offices, co working space, training rooms and virtual offices. We offer managed and serviced office space with plug-and-play facility, power backup, air conditioning, wi-fi, tea, coffee and housekeeping. We also allow businesses to rent spaces on daily and monthly basis with services such as virtual personal assistant, business concierge and administration support, desk on demand. QCafes are business cafes which are branded and organized work cafes for the modern recruits of India. They offer a hassle-free workspace at prime location and are present in Gurgaon, Delhi and NCR. These safe and trusted QCafes offer their unused space when their footfall is low especially during the office hours as the co-working space. These cafes have been proved favourable to the workforce who needs to travel to different locations for meetings, training and are a wonderful setup for catching up with peers as well. Most of the time “you are right”. Listen to others who can motivate you to be at next level. Avoid negative environmental vibes. Recently we have raised angel funding from from Investor consortium led by Anuraag Jaipuria (Director, Jai Drinks Pvt Ltd), Ruchirans Jaipuria (Director, Jaipuria Beverage and Food Pvt ltd) and Rishi Kajaria (Joint MD, Kajaria Ceremics Ltd.), where our existing investors Dheeraj Jain (Partner Redcliffe Capital), Ankush Nijhawan, Gaurav Bhatnagar and Manish Dhingra also participated in the round. Earlier we had raised seed funding from a group of investors led by Dheeraj Jain of Redcliffe Capital. Other investors included Jagdish Kumar (former regional director – APAC, DuPont), Bharat Gupta, Ankush Saigal and Praveen Saini. We are creating more awareness about the concept and Qdesq, and answering any apprehensions of corporates and clients in most suitable manner. We have doubled the number of venues and visitors on our site in last 3 months. We solve the challenge of long term occupancy through seamless platform interface and ops. In coming years, we aspire of creating this as an industry itself and be the demand and supply engine of this space fuelled by innovative technology solutions. Preventing brain drain and keeping our collective knowledge intact comes from company’s culture. We support our team’s effort to share their insights. We value continual learning and recognize people’s efforts. This ensure us to keep knowledge where it belongs and help new employees to pick up the work. While it is difficult to stop attrition completely, we have practices in place which have helped us to control it to a great extent. We believe in building people capability and make them the leaders of tomorrow. We invest in their career, provide growth opportunities and communicate to them. Making “to do list” everyday and evaluations towards the end. Extreme amount of positive attitude towards team and clients. “Think big” about the business and the problem it is solving. Energize body mind and soul with only positive thoughts and actions. Be the change You want to see. To be a leader, you need to set an example – you need to undergo each and every process/learning of the business yourself before you strategize and delegate for the team. You can surprise yourself. You just need to have willingness to mould and change – magic happens automatically in terms of tuning you to every day’s required agility. We are currently growing at 60% MOM on revenue side. In terms of supply, we add 20-25 Qdesq verified venues every month. We aim to have 200 monthly bookings in on-demand business and 500 workdesk under ongoing monthly occupation before our first year anniversary in December this year. In next 3 years, we we aspire of creating this as an industry itself and be the demand and supply engine of this space fuelled by innovative technology solutions. Not really. I value and appreciate the way my career has shaped up. Each and every moment of success, failure or frustration added to the entrepreneurial acumen.